I’ll bet many of us are a little over 2 weeks away from having more hard boiled eggs than we know what to do with! 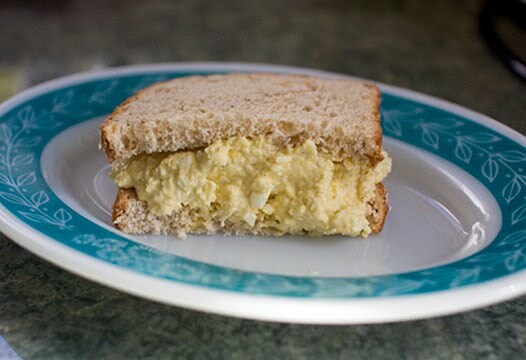 I make my egg salad in a food processor because it only takes about 5 minutes, and really , it’s only egg salad, so there’s no reason to complicate matters. I pulse the celery and onion in the large work bowl outfitted with a chopping blade until it’s chopped pretty small, but not too small because it will get even smaller when I add the eggs, etc. and I like a bit of crunch. Then I peel the eggs and add them whole, along with the mayonnaise, mustard, salt and pepper. I pulse it again until it’s well mixed and still a bit chunky, but this is really a matter of personal preference. Today, I ate it on a slice of multigrain bread… delicious! That sounds absolutely delicious, will try out at the weekend. In the UK we get a four day Easter weekend too, but forget the hard boiled eggs, we go for chocolate ones in a really big way!!!! !